British artist Alan Aldridge has created a one-off Mini Aldridge Special as part of a display of his work at the Design Museum in London. You may recognize Aldridge's work from a variety of book and album covers from the 1960s and '70s or simply from experimenting with such drugs as LSD and psilocybin. 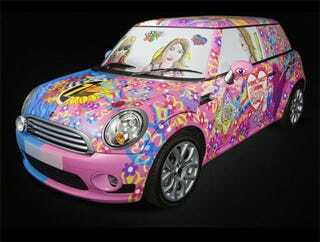 The new psychedelic Mini is said to be an "updated interpretation" of a famous 1965 Sunday Times cover featuring an original Mini done up in the artist's unique style, but in reality, it's a brilliant marketing move by Mini to link the new car with the old in ways even the retro styling can't accomplish. Press release after the jump. MINI Aldridge Special makes public debut at Design Museum A unique MINI featuring a visually stunning exterior designed by legendary artist, illustrator and graphic designer Alan Aldridge, is now on show at the Design Museum in London. The MINI Aldridge Special is an exhibit in a retrospective display of Alan’s work, entitled ‘The Man with Kaleidoscope Eyes’. Alan Aldridge is known primarily for his creative work throughout the 1960s and 70s. Dubbed ‘The Graphic Entertainer’, Aldridge illustrated lyric books for the Beatles, album covers for The Rolling Stones, The Who and Elton John, was Art Director for Penguin Books and illustrated much-loved children’s books such as ‘The Butterfly Ball’. Now working in Los Angeles, Alan Aldridge was keen to mark the opening of his exhibition by recreating an iconic cover of the Sunday Times Magazine, which in 1965 featured a classic Mini painted in his own, inimitable style. The updated interpretation of this image, using a new MINI One as the canvas for Alan’s design, featured in the 12 October 2008 edition of the publication, again, warranting front cover status. The MINI Aldridge Special is adorned with an array of images, shapes and patterns, each reflecting either a male or female theme, just as the 1965 car did. The design theme is split between each side of the car, the driver side being largely set on a blue background and masculine in appearance, with passenger near side artistry backed on pink. MINI UK General Manager Andy Hearn said: “The work of Alan Aldridge is synonymous with some of the most important names in the history of British culture, so MINI is delighted to support this exhibition by offering Alan a car to work on. “MINI will be celebrating its 50th birthday in 2009, so this is the perfect way to begin celebrating 50 years of the car in the UK.” ‘The Man with Kaleidoscope Eyes’ exhibition runs until 25 January 2009. MINI fans and the British public will get another chance to see the MINI Aldridge Special in the metal at MINI United next year, the global MINI event which will be staged at a renowned British race circuit between 22-24 May 2009. Further details will be announced by MINI UK in the near future.